Solid wood tables with that special something. 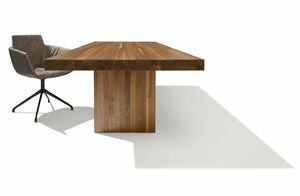 Our dining tables combine the pleasure of solid wood with prize-winning designs in various styles, including four-leg or pedestal tables, wooden or metal slides, and organic or linear forms. A wide choice of extendable and non-extendable tables gives you plenty of design options for your dining room. Matching chairs and benches complete our extensive range. Innovative table extensions with cushioned, integrated table inserts bring convenience and flexibility into your day-to-day life. The table inserts can be made with coloured glass or solid wood and in various lengths, perfectly tailored to meet your individual requirements. Traditional craftsmanship combined with the latest technologies guarantee the highest level of quality and durability. We make sure of this ourselves by testing again and again at our in-house lab.